Five of your fellow Unsolved Mystery Club explorers have disappeared while searching for evidence of Ancient Astronauts. 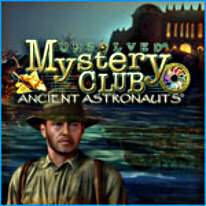 Join the Unsolved Mystery Club in the hunt for the missing explorers and unlock ancient secrets of the past. Explore exotic locations around the world and uncover artifacts supporting the existence of visitors from other worlds. Solve puzzles, master perplexing mini-games, and collect artifacts as you gather evidence to answer this question: Who are the Ancient Astronauts?